Won't Be LongLet's take it from the top, shall we? Yes, let's! When, in 2001, they played 250+ shows, wowed audiences from Tokyo to Trondheim, from Glasgow to Georgia, reintroduced rock in the mainstream (No, I mean actual ROCK MUSIC) and truly became everybody and their mama's new favourite band, their plan had already been in action for seven years. 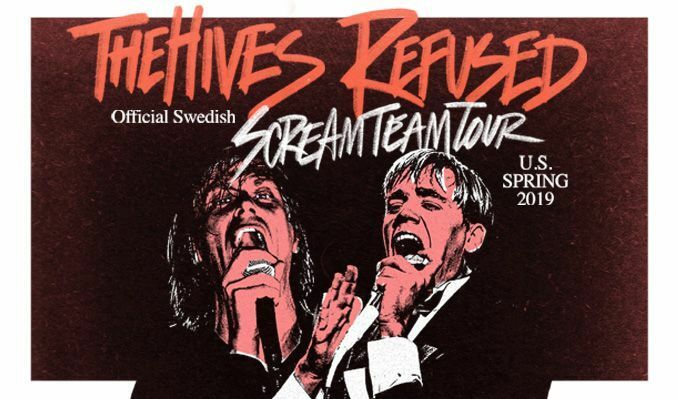 Formed in the small industrial town of Fagersta, Sweden in 1993, the Hives, then in their early teens, were saved from boredom and despair by Mr. Randy Fitzsimmons. He came to them with the idea to start a musical group based on everything he and the band found exciting. In the year 1999, the Hives have a new bag of tricks and a handful of Fitzsimmons originals. They know exactly what to do - record a record so good the world can't ignore it. They release Veni Vidi Vicious and nothing is ever the same. Rave reviews, more touring and that steadily growing cult following that can no longer fit into the clubs they play. A full year and a half of sold out shows later... Cue big time UK industry guy and all round music fan Alan McGee (Oasis, Primal Scream, Creation Records) sees the Hives on German TV and decides that this is important. He has the band put together a form of greatest hits for his Poptones label. Your New Favourite Band, as the result is dubbed, catches a sleeping England by surprise. Rock music that is exciting and dangerous not really being the toast of the town lately. Cue 'Rock is back!' headlines in newspapers and on TV. "We always knew the world would catch on, we just had to wait them in", as the band themselves say. Cue hits "Hate To Say I Told You So" and "Main Offender" and things are drastically different. People in the UK once again connect rock bands with showmanship, excitement and an actual good time. Your new favourite band? Indeed.